BULAWAYO, Jan 5 2012 (IPS) - Thomas Dlakama has experienced what he calls “January disease” all his working life. This phenomenon afflicts millions in Zimbabwe, and its symptoms include an empty purse, rising blood pressure among irascible breadwinners, and a general inexplicable hope of manna from heaven. It strikes during the first month of the year, and for Dlakama, it has become an unwelcome ritual where his finances are depleted after the festive season and he has to start thinking about his children’s school fees, his own budget as a poorly paid civil servant, bills and everything in between. January “is a terrible time of the year, and it has become a tradition for me to start borrowing money soon after New Year’s Day,” Dlakama says about January disease and his lifelong relationship with microfinance. He is one of many poorly paid workers who find themselves making a beeline to microfinance institutions in Bulawayo, where workers such as civil servants make up the bulk of clients despite concerns about poor regulation, which has bred unscrupulous microlenders. “The money-lenders are taking advantage of our poverty by demanding ridiculous interest rates,” Dlakama complained. Microfinance institutions charge interest rates of between 30 and 40 percent, while backyard money-lenders who do not demand collateral can charge up to 50 percent interest. 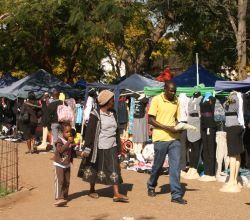 Microfinance saw a resurgence after Zimbabwe suspended the use of its currency as legal tender in 2009 – the Zimbabwe dollar was replaced by foreign currencies like the euro, the U.S. dollar, the pound, the South African rand, and the Zambian kwacha – to put an end to hyperinflation. Low salaries force Dlakama and other workers to seek out microloans to cushion themselves against economic hardships. But despite being promoted by both government and development agencies as a critical player in developing countries where millions have poor incomes, the microfinance sector in Zimbabwe has been criticised for creating debt traps for the poor by charging high interest rates. Microfinance institutions (MFIs) issue their loans according to the monthly salary of the client. And in a country where there are glaring disparities between incomes and the cost of the consumer food basket, they have become fertile ground for bogus operators to thrive, analysts here say. The Consumer Council of Zimbabwe (CCZ) says an average family of six requires more than 500 U.S. dollars per month to meet basic needs, including utility bills, while the Zimbabwe Congress of Trade Unions (ZCTU) reports that some of its members earn as little as 100 dollars per month. Civil servants such as teachers, who have become the prime clients of MFIs, which target them because of their steady salaries, earn a little over 300 dollars per month. “I know January disease too well,” says Jennifer Darirai, a secondary school teacher. “I have four kids all of whom attend boarding school, and with my salary I cannot afford to meet all these obligations and have to turn to microfinance lenders, but rather reluctantly. What can I do?” she told IPS. It is this desperation that has led to the sprouting of MFIs across the country. And while the Ministry of Finance noted that there were 37 legally registered microfinance institutions in late 2010, industry officials say the number could well be into the hundreds, as many are operating from backyard offices without licences. Microfinance policy is governed under the Financial Laws Amendment Act, which requires that non- banking financial institutions be registered. “There are too many microfinance organisations sprouting up and taking advantage of people’s poverty; what we need is stricter monitoring,” said Garfield Murombedzi, a senior microfinance adviser with a local bank. “We are seeing it too often – people coming to seek bank loans to pay off debts elsewhere. Something is obviously wrong somewhere,” Murombedzi said. “But we still cannot keep track, as even operators whose licences expired continue to do business as usual, while at the same time others are operating without bothering with registration,” he added. Since the country’s independence in 1980, microfinance has been viewed as a source of easy money, and has failed to shake off criticism that it has forced low-income earners into perpetual debt. “We understand concerns being raised by some people, but I believe this has largely been because of unscrupulous lenders,” Dube said. “Some of us are qualified bankers and know the industry regulations well. But these people who are giving us a bad name and charging exorbitant interest rates, taking people’s property without justification, are operating outside our mandate,” Dube said. “We are a properly regulated industry, but like any other, you are bound to find con artists among us,” he told IPS. The Zimbabwe Association of Microfinance Institutions says members who flout regulations risk being deregistered. But Murombedzi said cash-strapped people often fail to check whether or not these institutions are registered or are charging the recommended interest rates. “I think that is the issue that is important here: many sectors in Zimbabwe are demanding self-regulation, but people flout their own rules; surely a higher authority must move in,” Murombedzi said, referring to the poor monitoring of microfinance. The Ministry of Finance has in the past warned against unregistered financial institutions, with some banks even being shut down at the peak of the country’s economic chaos in 2008. But with poor incomes existing side-by-side with poor monitoring mechanisms, unscrupulous microfinance institutions are likely to be around for a long time to come.